It proved to be a frustrating night for Athlone Town in Dublin last Saturday evening (April 28 ), when their game against Cabinteely FC came to a premature end. The generator powering the floodlights overheated midway through the second half, leading referee Eoghan O’Shea to bring the game to a halt with more than 20 minutes left to play. 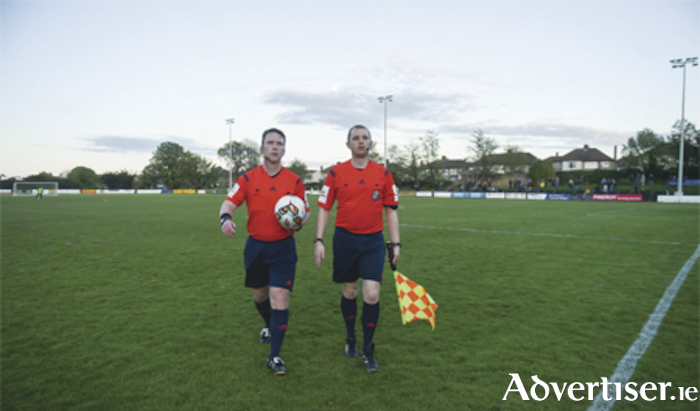 The FAI confirmed afterwards that the game will be replayed, with a new date to follow in due course. The home side would have been disappointed at the premature ending ,as Marty Waters had found the net on 19 minutes to open the scoring. The sun was shining for all of the opening half, which had kicked off at7pm. Dean Casey had an early chance for the hosts when he fired just wide of the far post. The opening goal came after 19 minutes when the Town defence were punished for failing to clear the danger from a right wing cross. Karl Byrnes' delivery fell to Waters, who found the net from 10 yards range. It was yet another sloppy goal conceded by the Athlone defence. The visitors responded with a corner kick from which Aaron Brilly's strike was put behind for a second corner, which came to nothing. Cabinteely’s Joe Doyle had a shot blocked, with Conor Keeley firing wide as the home team went searching for a second score. Athlone had few opportunities to test Finn McGowan in the home goal. A right wing cross from Josh Hogan was safely gathered by the keeper before a Town player could pounce. The lights were on for the start of the second half, but in the sunshine few noticed when they went out again later. Cabinteely always looked likely to add to their goal tally following the resumption of play. Some poor finishing, however, from the many chances they created let them down. Waters and Keeley were both off target, while Doyle and Casey also failed to hit the target with later shots. Midway through the half, Doyle headed over, which proved to be the last action of the game. The ref brought proceedings to a halt, and while there was some hope that the game could resume, an announcement confirmed the abandonment. The generator had overheated and could not be repaired. Athlone did have a further outing on Monday night in the Leinster Senior Cup, when the holders Shelbourne started the defence of the trophy. The game looked to be heading to extra time when the visitors struck for the winner with four minutes remaining. A cross field ball picked out Shane Farrell on the right, and his volley hit the back of the net. Aaron Callaghan’s men have another home game at the weekend when they entertain Galway United. Shane Keegan's men have yet to win away in the league, but will be confident of recording a second win of the season over the Town.